Twenty years ago, a contract with the Department of Veterans Affairs started Alphapointe on a path to success in medical products manufacturing. In the early 1990s, plastic injection molding was a new enterprise for Alphapointe, an NIB associated nonprofit agency based in Kansas City, Missouri. 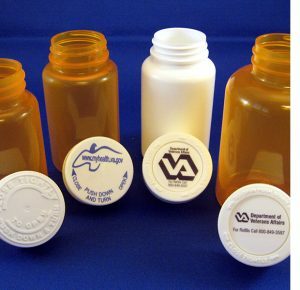 The agency’s work producing specimen bottles for the Department of Defense caught the attention of the Department of Veterans Affairs (VA) just as it was planning to create an integrated, automated prescription fulfillment operation, known as the Consolidated Mail Outpatient Pharmacy (CMOP), recalls Alphapointe President Reinhard Mabry. If it could meet the VA’s rigorous quality standards, Alphapointe would have a unique opportunity to provide bottles for the new dispensing system. But to show it could meet the VA’s criteria for product dimensions and quality, Alphapointe needed to invest tens of thousands of dollars to produce test molds. “This presented a bit of a financial risk for Alphapointe,” said Mabry “but the chance to provide more jobs and opportunities for upward mobility for people who are blind was worth it.” When the test molds – which cost about $40,000 each – were approved, permanent molds were created at a cost of $250,000 to $300,000 per mold. The investment paid off and by late 1994, when the VA launched its first CMOP at Leavenworth, Kansas, Alphapointe was providing all of the prescription bottles used in repackaging bulk drugs purchased from manufacturers. Veterans Affairs has since expanded its program to include seven CMOP facilities across the country, filling 120 million prescriptions each year. Since the program’s inception, Alphapointe has produced roughly 750 million prescription bottles. In 1995, only one or two employees worked on a VA contract valued at $400,000. In 2014, twenty people who are blind were employed over three shifts, five days a week, to provide products for VA contracts valued at nearly $4 million. To keep up with demand, Alphapointe has built a new facility, instituted training programs, increased its quality standards to meet or exceed VA specifications, and achieved ISO 9000 certification. Its plastic injection molding business is thriving, supplying additional federal clients and private-sector customers such as Motorola and Ford. Article by Rosemarie Lally: Rosemarie Lally is a freelance writer and editor based in Washington, D.C.